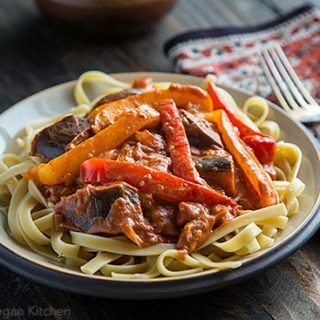 In this eggplant version of chicken paprikash, Hungarian paprika gives the sauce its vibrant color and rich flavor while tofu sour cream adds creaminess. 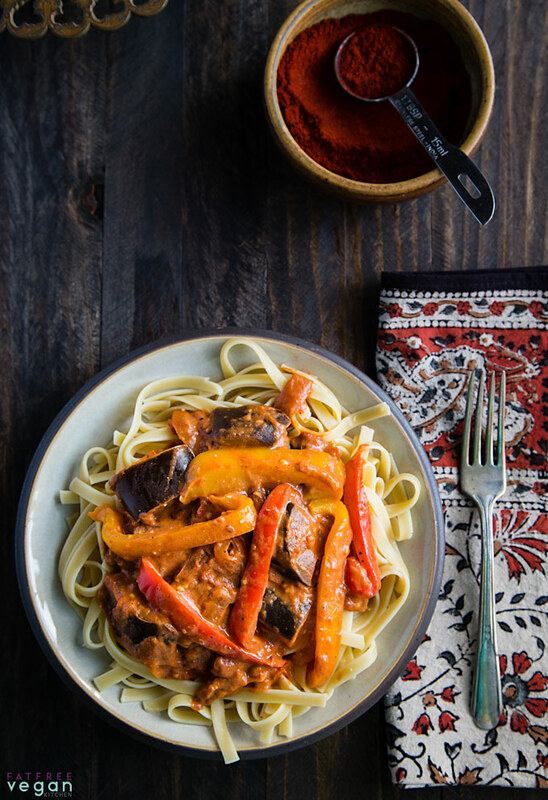 Yes, it’s my weekly eggplant recipe! I know you’re as excited as I am. After all, you can never have too much eggplant. 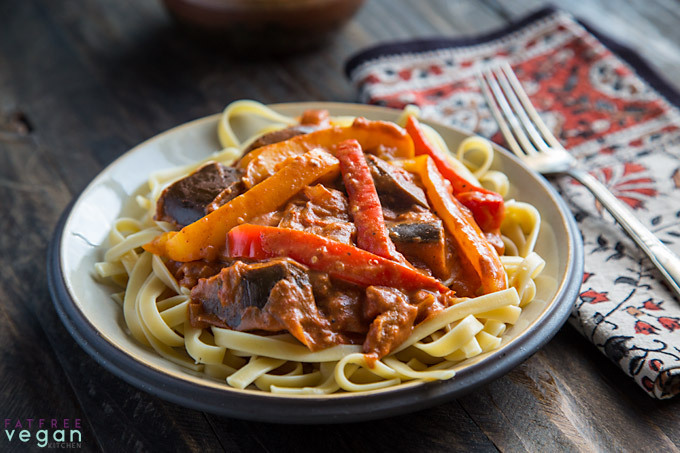 As part of my agenda to convert everyone into Eggplant Lovers (aka Aubergine Admirers and Brinjal Buddies), I’ve transformed the traditional Hungarian chicken paprikash into a vegan dish worthy of an eggplant. Mild Hungarian paprika gives the sauce its vibrant color and rich, distinctive flavor, while tofu “sour cream” adds creaminess and zing. 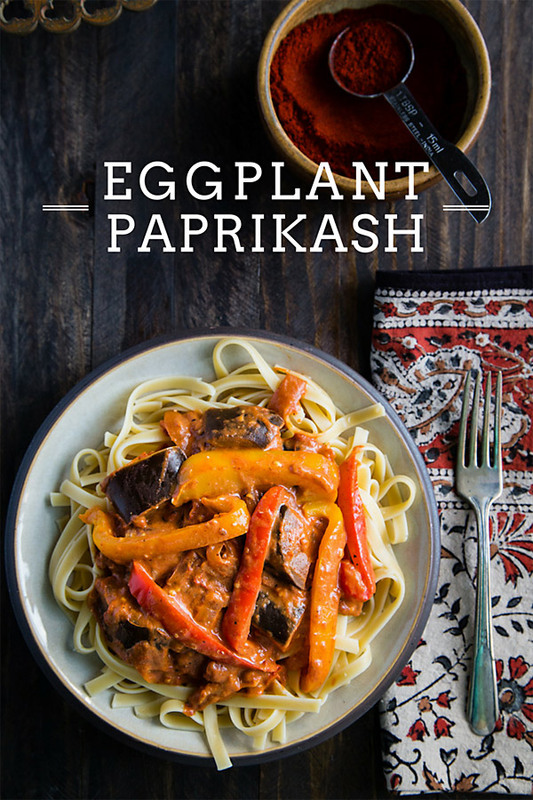 This is one of my favorite eggplant recipes. Please try it, even if you hate eggplant. It’s converted lots of eggplant-phobic eaters! I made this meal for my family as we wanted something new and different. Everyone LOVED it, except the 10 month (but really, it is a lot of flavors together, probably overwhelmed her LOL). I did not have liquid smoke, so did without, and I forgot to add the sour cream at first, so we dolloped some on the top and we were all happy!!! This is definitely going on my list of meals to do monthly!! Hopefully the baby will learn to like it hehe. I tried this recipe on Sunday and I must tell you: it was DELICIOUS!! I was not a fan of eggplants, but since I returned to my home country I had a few chances of eating eggplants (in vegetarian/vegan restaurants) and I simply fell in love by the stuffed-oven cooked eggplants. Then, I decided to experiment other ways of cooking it and I rushed into you blog ;). I made this one, and while I was doing it, I was mouthwatering – literally! lol. The tofu sour cream is way much better than toffutti brand, I loved it! PS – I’ll try the others as well ;)! Added mushrooms, which stole the show, but this dish would be amazing regardless. I had to stop myself from eating the sour cream by itself! We made this last night for dinner and it was really great! I was worried I didn’t have the right amounts of eggplant and peppers and as we cooked I kept worrying it wouldn’t turn out. It turned out great regardless! I love the starting by cooking the onions in just water rather than oil, what a great idea! Looking forward to trying this recipe, Susan, but am I missing something? I couldn’t see a way to get to a “printer friendly version” of this one. I printed it out anyway but it took seven pages instead of one! I’ve always been able to access the printer friendly version of your recipes before. Help! Sorry, this recipe was posted before I started adding printer-friendly versions. I’ll put it on my to-do list, but if anyone wants to print it out before then, try selecting the text and then choose “print selection.” It may not look as good as a printer version, but it will save a lot of ink and paper. I just made this for my family for dinner, and it was a sensation! Everyone had seconds, and we have plently left over to take for lunches. My mom in particular was skeptical of this turning out, but when she tasted it she literally ate back her words! Sharmila, I’m so glad you liked it! I haven’t made it in a while, and I need to so that I can take a better photo of it. I dont have liquid smoked flavoring is there anything else i can use? If you have smoked paprika, use it instead of regular and leave out the liquid smoke. Or you can substitute any kind of smoked salt or just leave the smoke out altogether. Aubergine Admirers, I like that. Somewhere in my Internet travels I found a company that produces shirts for you as needed and deals with shipping, you get some commission and don’t have to guess what size your readers are and hold onto boxes of t-shirts at home. All I’m saying is that if you found that site and a good font, I’d be willing to buy an Aubergine Admirer shirt from you. I was looking for inspiration to use my eggplant and also used the frozen fire roasted pepper/onion mix from Trader Joe’s and smoked Paprika. I excluded the tofu sour cream, but it was still really yummy! just made this, it was delicious. never used smoked liquid before and it was a nice touch. i also just used tofutti sour cream instead. i served my paprikash over gnocchi and i think it would have been better with a dumpling/spetzel. there was something missing from it that didnt quite bring back the childhood memories. im going to search my grandmas old recipes for that secret ingredient. loved the eggplant instead of chicken. great suggestion! super easy and inexpensive; everything was pretty much in my garden. oh, i also salted and paper toweled my eggplant. just what i grew up doing and it made me nervous not to. i dont know if that was necessary or not. My mom was born & raised in Hungary, thus I grew up eating fabulous Hungarian food. 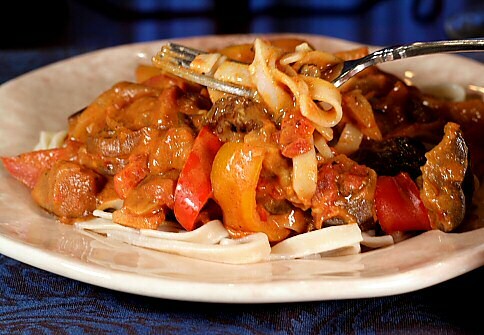 I make goulash and paprikash for my family, but I don’t eat these meat & chicken laden dishes! I really have missed the subtle favors of paprika, peppers, onions and sour cream! I have looked at many meatless recipes, but many have lots of added fat. I tried one recipe with disastrous results! Yuck! I was beyond thrilled when I found this recipe! Sadly, I couldn’t convince my family to give it a try, but that only leaves more for me!! Thank you! I made this for dinner tonight…complete with the ‘sour cream’. It was very good! I did make some changes to suit my taste: I added some crimini mushrooms, because I had them to use up. They blended right in with the eggplant. Also, I ended up using quite a bit more lemon juice to make the sour cream match the acidity I like; and I will use something else instead of tahini next time, as I did not care for the flavor in the sour cream. But….with the tahini, it is the base for a very good dip, salad dressing, etc. I can see myself using this in the future when I need a good white sauce 🙂 Thank you Susan for sharing your recipes with us! Delicious….I even got my daughter to try it and she is super picky…she liked it. Being Hungarian and growing up in a town that was 1/2 Hungarian and 1/2 Finish this filled the void since starting ETL. I stuck to the recipe except for one change. I read a cook book a few years ago that said the Paprikash we grew up eating in the US was not exactly like the true Hungarian version. They use a pepper that was not available in the US when our relatives arrived in the us so it was left out here. Now there is a close replacement available. The cubanelle pepper. After eating the version minus the cubanelle for 40 years the difference in taste was amazing. I added two large or 3 medium cubanelle peppers diced along with the red pepper and it was great. It seems like a small change but the difference in taste was anything but small. Also I found that whole wheat orzo pasta while not like the spatzel it works and is quick and easy. Thanks Susan for your great recipes. It’s made striking to the diet so much easier. You work is much appreciated. Just made this, it was delicious! Really, really good, and also fast and easy so I think I will make it many times in the future. I used smoked paprika instead of regular and skipped the liquid smoke, and had to use cashew sour cream instead of the one in the recipe, since I can’t eat soy. Turned out great! Had the classic Chicken Paprikash in Budapest years ago (not vegan back then) and it was served with spetzel, I think thats standard, and it reminded me of gnocchi, so I think I’ll try this recipe with gnocchi next time! 🙂 Thanks for sharing your great recipes! do you think it would taste as good if I eliminate the sour cream? Personally, I think it would taste good, but not as good. I like the creaminess the tofu sour cream provides and the way it balances and mellows the flavor of the paprika. It’s a different dish without the sour cream, but not a bad one. Susan, thanks so much for posting this recipe on Facebook for us eggplant haters. My husband is a bigger skeptic than I am when it comes to cooking eggplant, so when he expressed satisfaction towards this dish, I knew I really made something good! Thanks to you. The version I see here calls for smoked paprika instead of liquid smoke (which made reading the comments above a little bit confusing), but it just so happened that I ran out of smoked paprika, but had some liquid smoke in hand. So I added that and a little bit sweetener at the end. It is hard to believe that something this simple can taste this good. And I also think adding mushrooms / chickpeas / summer squash would be great too, but then it would be more like a ragout… The Tofu sour cream is definitely a winner. I served it over brown rice pasta. Again, thanks for another wonderful recipe! Hi! I always love your recipes. I hesitate to make the tofu sour cream because I don’t know what to do with the remaining 1/2 box of silken tofu. Can it be frozen? I’m just cooking for my husband and me, I like to conserve and not waste. You can use it for chocolate pudding, scrambled tofu, hot and sour soup, or any dish that calls for firm tofu (just take it easy when you’re working with it) like stir-fries and stew. It’s great in stir fries with spicy garlic sauce. Welp, you’ve done it again, Susan. I don’t really like cooked peppers OR eggplant, so I was a little hesitant to try this. If there’s one thing I’ve come to learn, though, it’s that if you promise that eggplant haters won’t hate something, I should probably give it a go. I did go a little heavy on the cayenne, which suits us just fine (but probably isn’t particularly Hungarian), and it was absolutely fantastic. Like, went-back-for-seconds fantastic. Thank you, as always! Wow, I made this a few nights ago and I just loved it, one of my favorite meals I’ve had in a long time. I used one large eggplant, along with a half package of portobello mushrooms sliced. I added about a half teaspoon of chipotle powder as per your suggestion. I also just used plain water instead of stock, which I always do. Thanks for sharing this recipe, it’s just so delicious that it will become a regular with us. Your website is a wonderful resource and my vegan cooking journey would not be so successful if you hadn’t decided–years ago–to be so generous with your time, your effort, and your amazing kitchen skills. Going to give this a go in the Instant Pot – should be quite easy. Finally made this recipe (in Instant Pot) and it was absolutely delicious. Going to try it again tomorrow with different veg to finish up the block of tofu. Definitely a keeper. I am overly fond of eggplant and a vegetarian. Always looking for new and exciting ways to make it more delicious. A coworker grows things. She has been giving me these pale yellowgreen peppers that were labeled mild heat and fruity flavor. It looks kinda like a piquillo without the pointy bottom but is paler than a banana. They are too hot for her and I want to say I have been gifted about 20 these past two weeks. I think to myself, the peppers in traditional paprikash have heat, let’s try these instead of bells to go with the small grafiti eggplant she gave me too. Didn’t read the recipe fully in my haste before picking up groceries. Thankfully had a can of Muir tomatoes I forgot I had, and fake chicken bullion. Used smoked paprika and hot Hungarian paprika, since I do not have normal. Kinda used a little more red pepper flake than I should. Am dying of heat overload, but it is worth every tear. So so good. Question. This seems very watery. I am letting it cook down a little more in the hope steam removes some liquid. Might be pouring some off before adding the real sour cream, just wondering if saving the water is better for the sauce. Gonna make rice and package this for a few meals. Thank you! I served it over gnocchi instead of a pasta and I also added mushrooms and sprinkled some parsley on top. The paprika sauce stucked to the gnocchi dumplings so well and made it a very yummy comforting dish. It was delicious! I knew it was good when my 14 year old daughter asked me for a second bowl. She is also trying to eat vegan. We both added this one to our favorite vegan recipes. Thank you for sharing it! What kind of pasta did you use? Fettuccine, but any type will do. What happens if you bought the wrong tofu (soft)? Does it come out not good? I’m going to try out this recipe tonight for the family. Silken is a little smoother, but soft tofu will probably work.